Today is Saturday, June 10, 2017, and is designated as National Iced Tea day on the NationalDayCalendar website. That sounds like a good thing to me. This is important to meat-and-three lovers, of course, because iced tea, especially “sweet tea” in the more southerly locales, is somewhat of a staple in this genre. It is often included in the price of a meat-and-three meal, for goodness sake. A quick “iced tea” search on Google or Pinterest finds a large variety of options, so maybe I should include links to some of those recipes or pictures or videos, right? Not. I love my sweet tea too much to not be totally partial to it! True confession: I had a small glass of sweet tea earlier this morning with my eggs and toast at breakfast! In honor of my beloved sweet tea on National Iced Tea day, here is a video from Southern Living about making Classic Sweet Tea, and it includes a twist I was unfamiliar with. For as many years as I have made and consumed sweet tea, I have never heard of adding this particular ingredient to the mix. It will definitely be in my next batch of sweet tea — most likely later today. Possibly after I cut the grass. At least before supper! Are you an iced tea lover? Do you include the “mystery” ingredient from the video in your sweet tea? 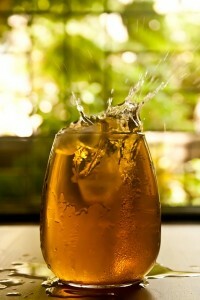 What’s your favorite iced tea recipe? Share it with with the rest of us on our Facebook page!